Hello friends, welcome to our home this Christmas! 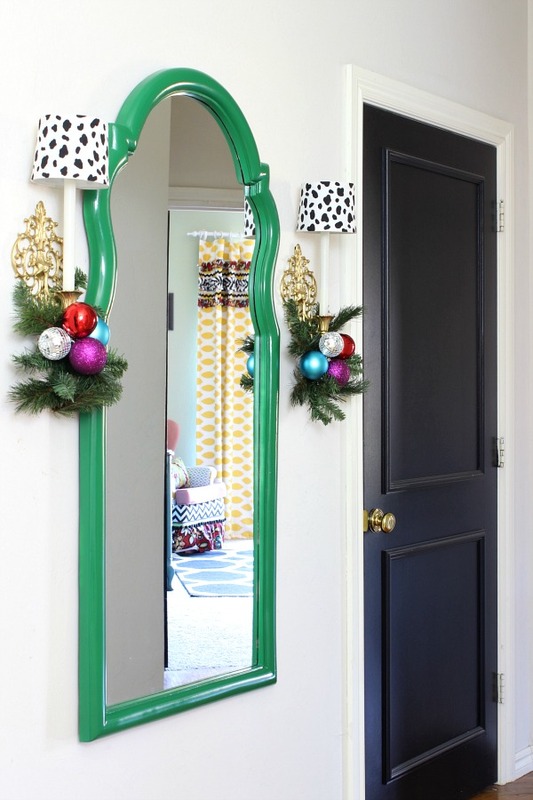 I'm thrilled to be part of Blogger Stylin' Home Tours once again, this is always one of my favorite weeks of the year. Thank you Lindsay from The White Buffalo Styling Co. for hosting this incredible group! If you're coming from A Designer at Home, welcome! 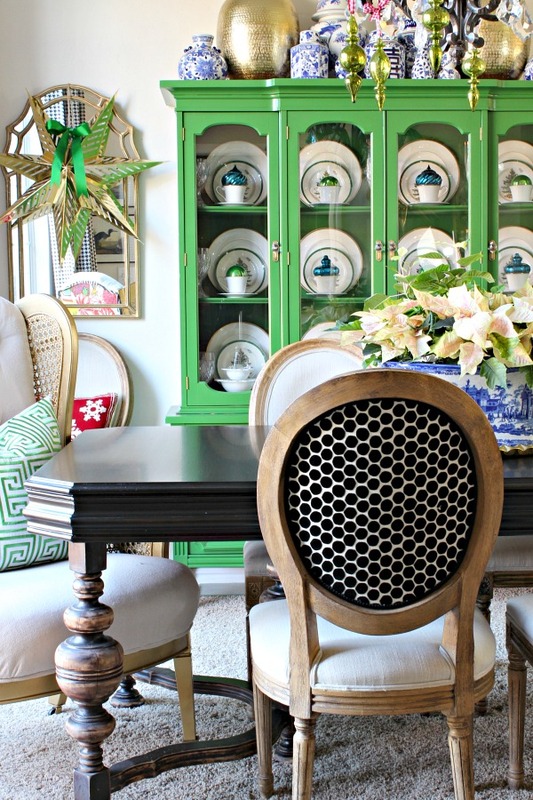 There are so many details to see in Corinna's eclectic, colorful tour. Today I'm happy to share a our spaces in the main part of the house with you. I generally stick to a traditional red and green color scheme for Christmas, but this year I branched out and added some jewel tones, and I absolutely love it! 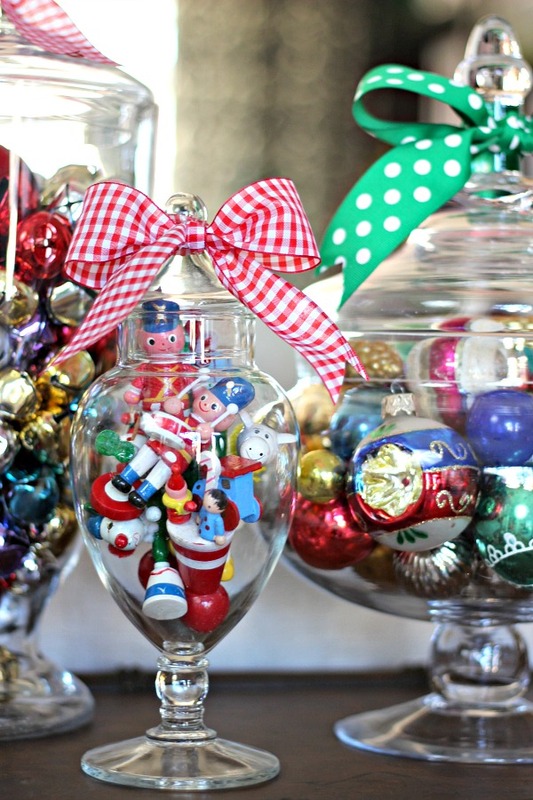 I bought a box of vintage ornaments years ago at a yard sale, and they are my favorites to display at Christmas. 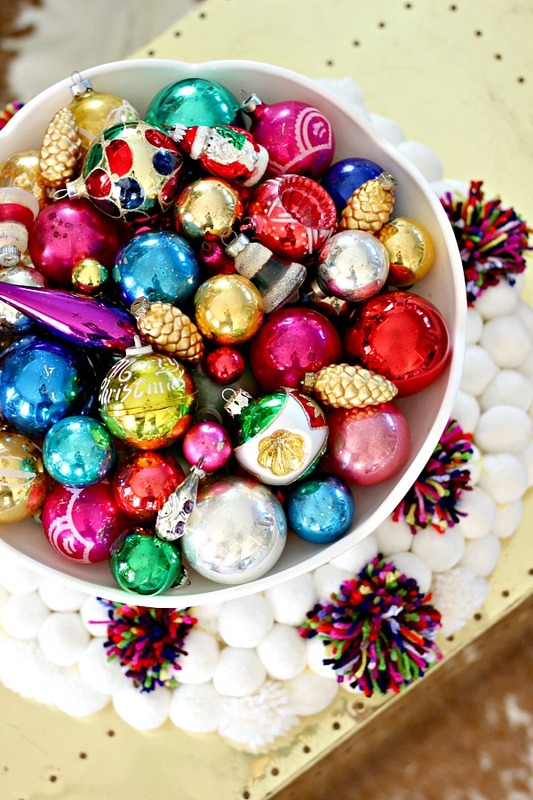 The more colorful and festive at our house, the better. 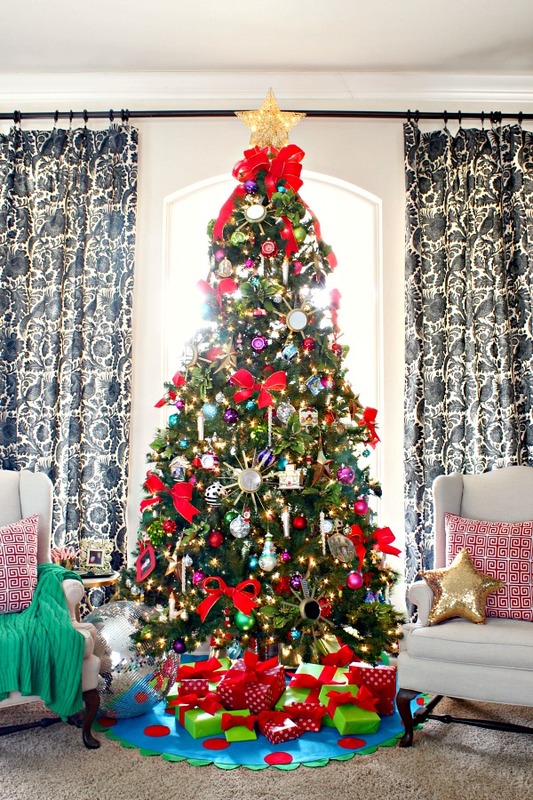 After all, we are celebrating the biggest birthday of all at Christmas, and I want our home to feel like a party! 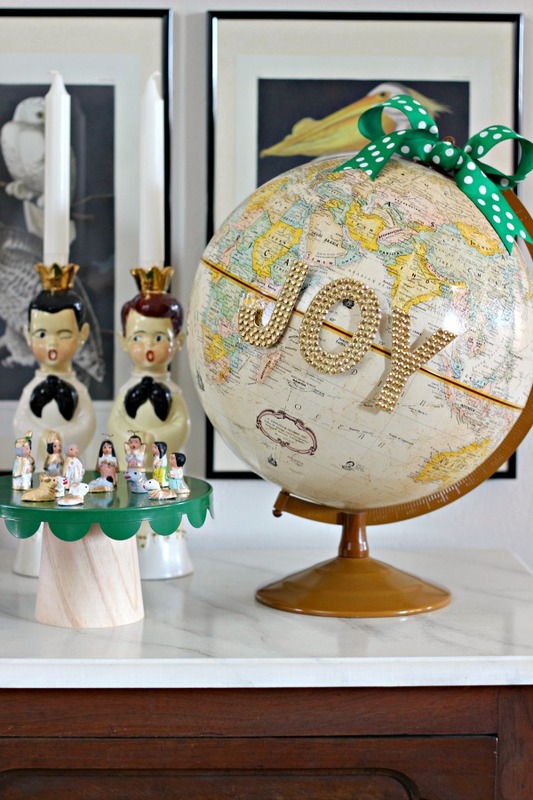 I love the old globes that I see painted with "Joy to the World," but I wasn't ready to paint on the only globe I have. So, I found these adhesive letters at Hobby Lobby, left them on their backing but trimmed it off around the edges, then used a few pop dots to attach them temporarily. Vintage choir boy candleholders, a tiny nativity from Cozumel, and a darling pedestal from the ($5) Dollar Spot at Target. Remember this guy? I got him fixed up and painted for the season! And you might remember, there are two! 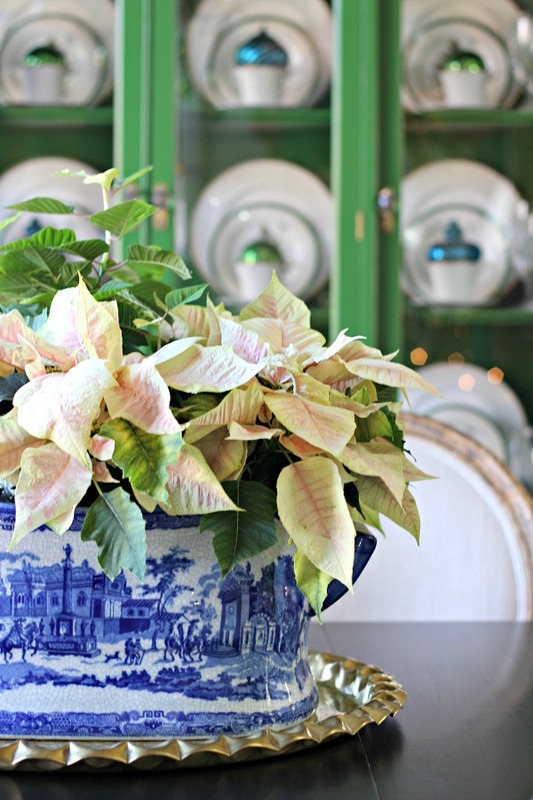 They will probably land out on the patio eventually, but I couldn't resist using them indoors for the season. Precious babies 13 years ago... time goes by way too fast! 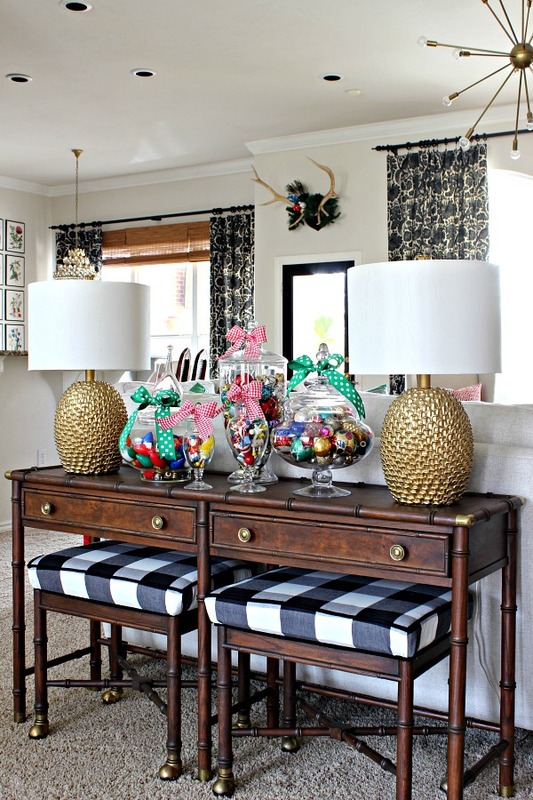 My new-to-me console table is my favorite new spot to decorate. I put together this simple display with a variety of apothecary jars. Places like Ross, Homegoods, and even thrift stores are good sources, but I've linked up a few online after the photo also. 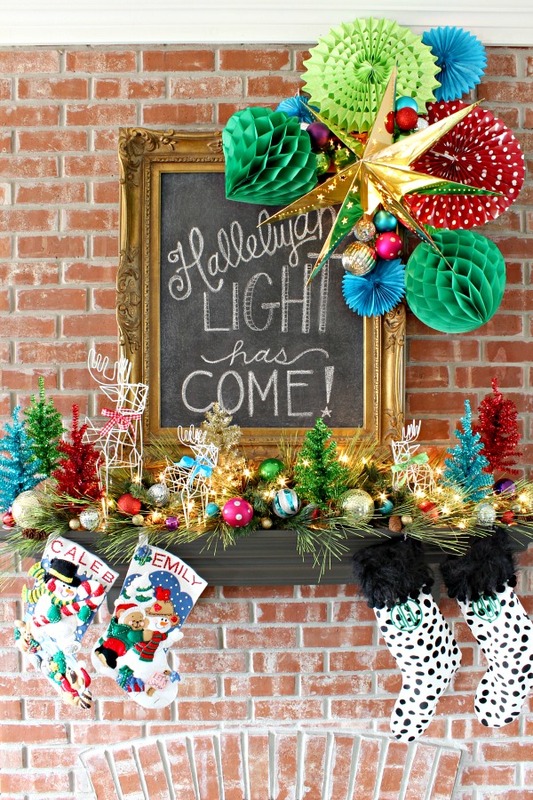 More of the vintage ornaments along with Christmas light bulbs (aren't these still the best?? Thanks for the idea @WingateLane! 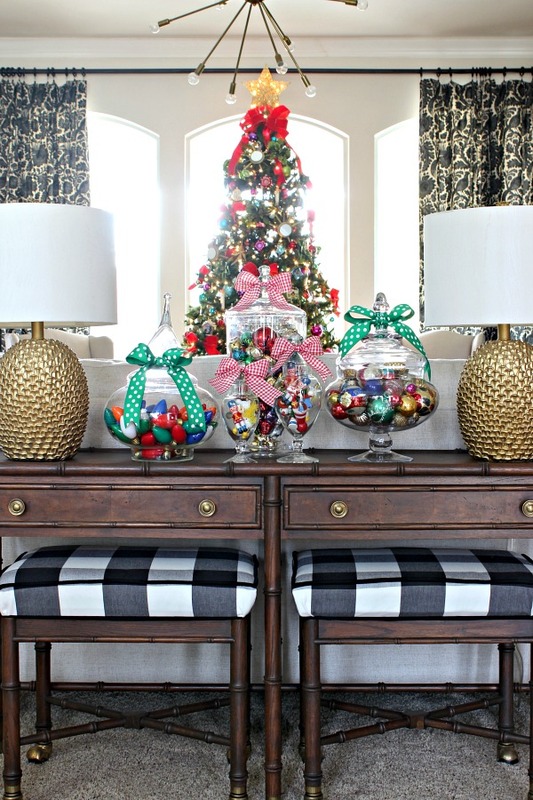 ), jingle bells, and vintage wooden toy ornaments all corralled in apothecary jars on the console table. 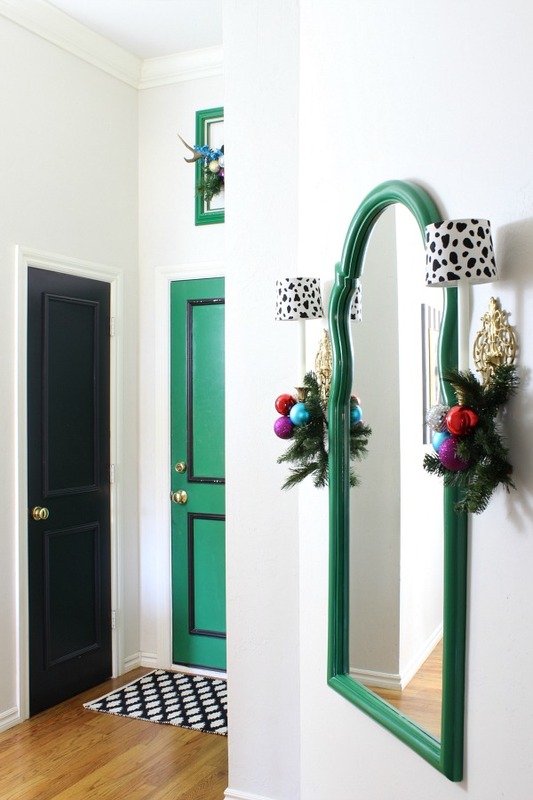 Last week I shared our back hallway that got a little makeover, it has some Christmas spirit too. 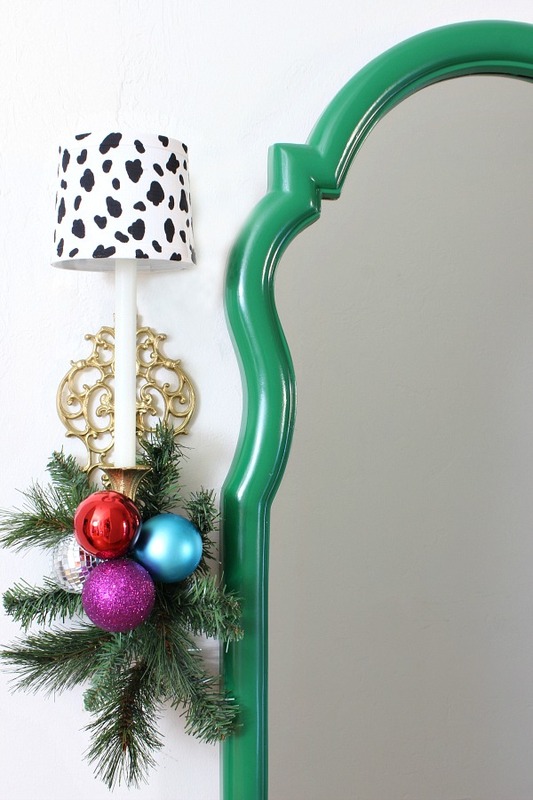 I love the look of sconces but we weren't wired for them here, read all about my easy fix here! I'll end the tour with our Dining Room today. 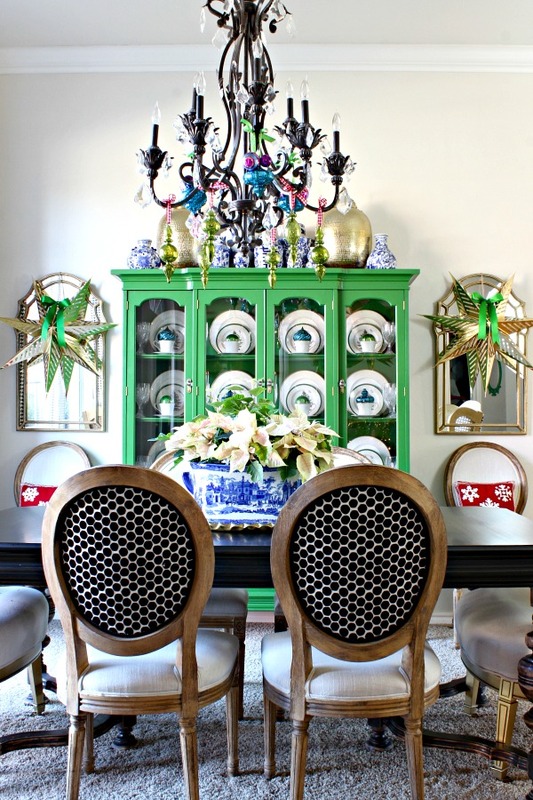 The green for the china cabinet (Pine Scent by Behr) was an especially good choice this time of year. 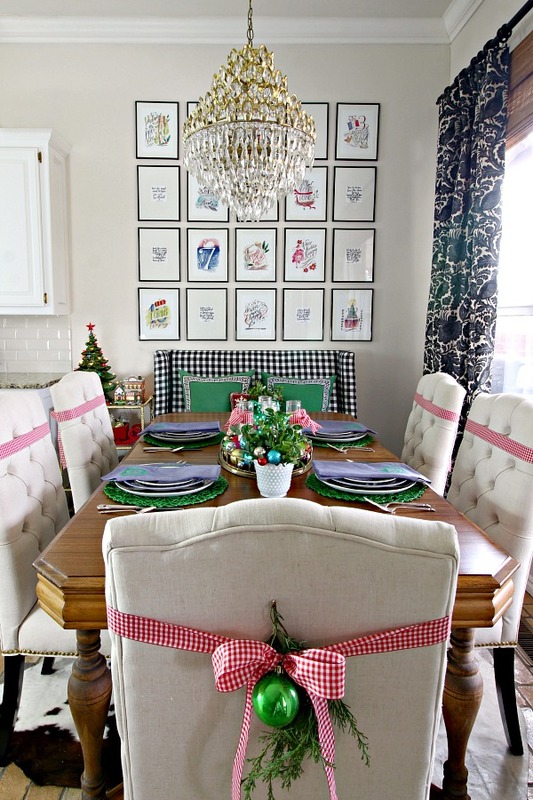 but I shared a fun tablescape recently. Click here for more details. Thank you so much for coming over! I'll be back on Thursday with part 2 of my home tour, I'd love to see you back then. The next stop is Place of My Taste. 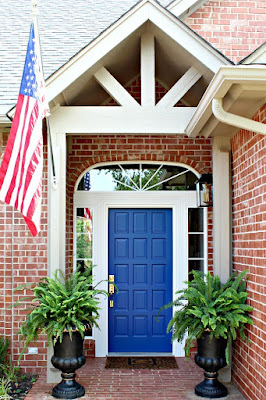 You'll love Aniko's beautiful photography and styling, and that blue front door... I think I'm running to grab a paint brush right now! If you enjoyed the tour today, I'd love for you to join my email list! You'll receive a notification straight to your inbox any time there's a new post on Dimples and Tangles, simply enter your address below. 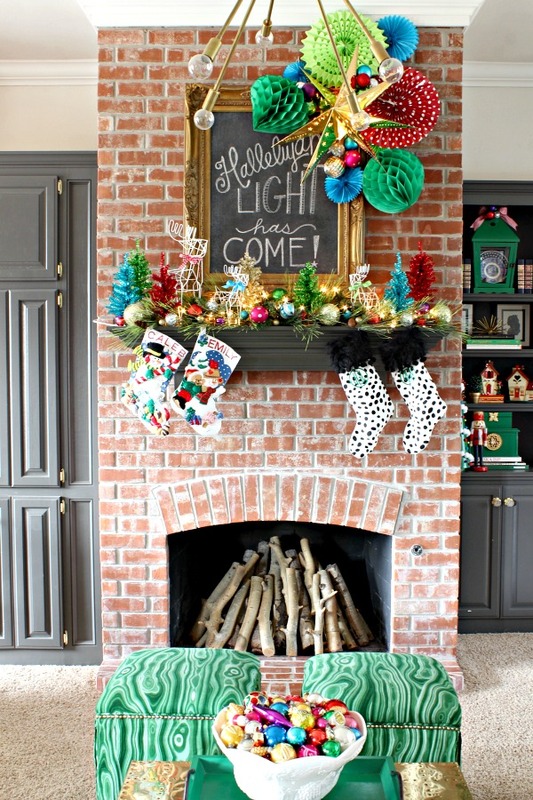 Linking up with the 12 Days of Holiday Homes Tours here. you do bold jewel toned color better than anyone! such a fun tour! 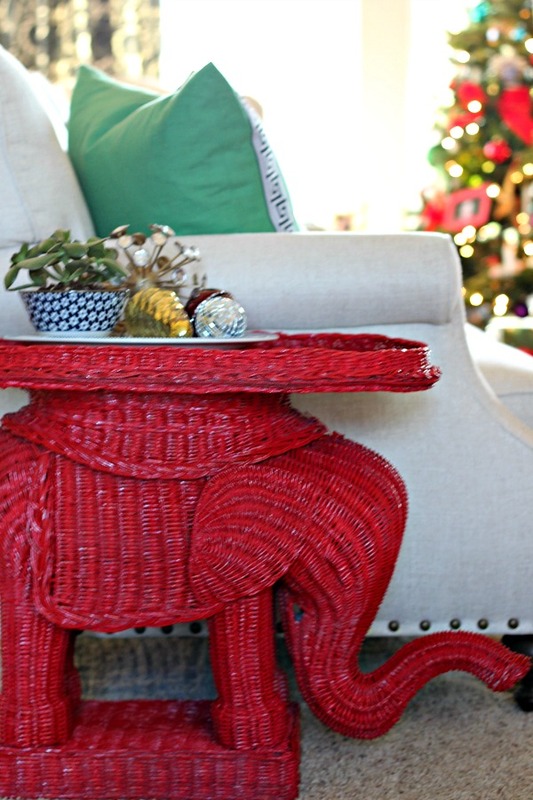 love the red on the elephants, too! There are a lot of home tours out there but your's is the one I've been waiting for and you didn't disappoint! My Mom has one of those punch bowls in her garage and I keeping trying to figure what I could do with it and then bam you have it perfectly displayed! As always love your use of color! Beautiful as always friend! I passed up that little cake stand the other day and have not stopped thinking about it. 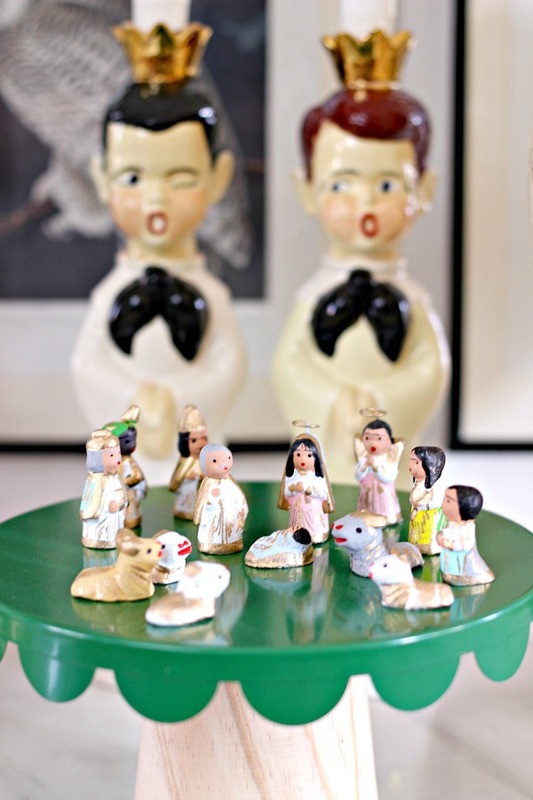 What a great idea to display your cute nativity! Now I know I'm going back to get one (or two)! It's ridiculous how happy a stranger's home makes me feel. OMG Jennifer, your home is just a feast for the eyes!!!! I'm in love with your colorful and bright color palette, it definitely suits your happy life and family! 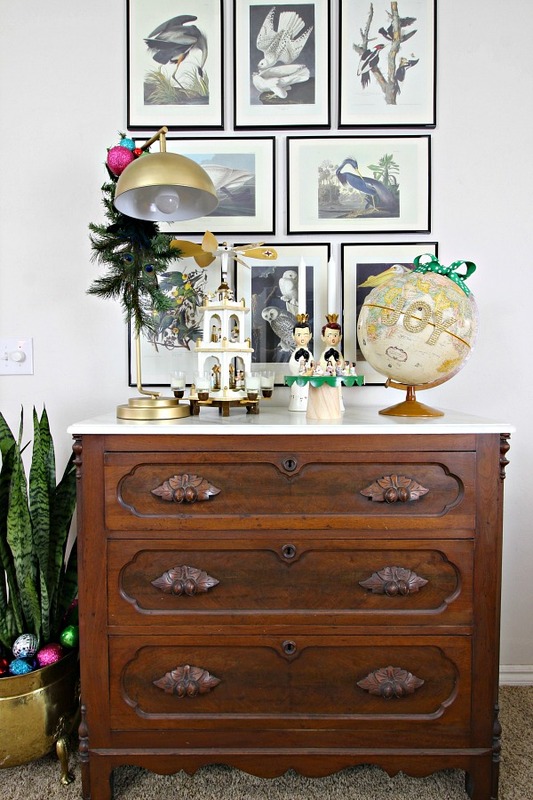 I can't pick a fave really, and I truly envy your collection of vintage ornaments! Just fabulous dear! 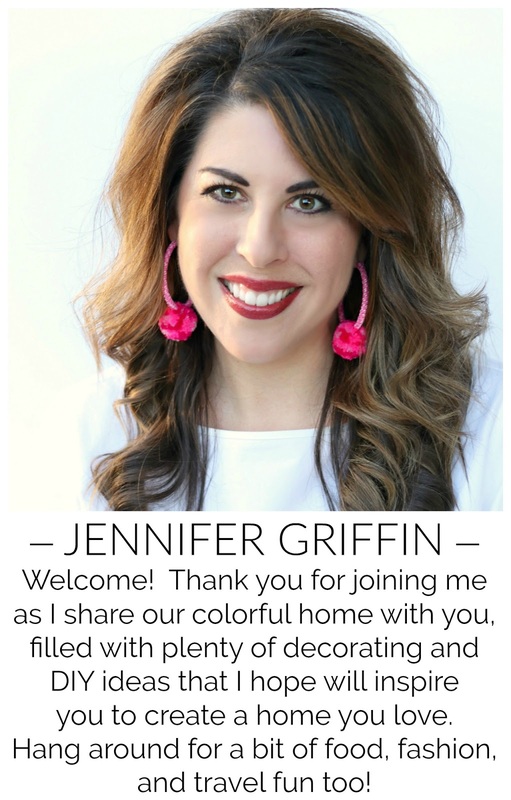 So very honored to share this home tour with you!!! Cheers! 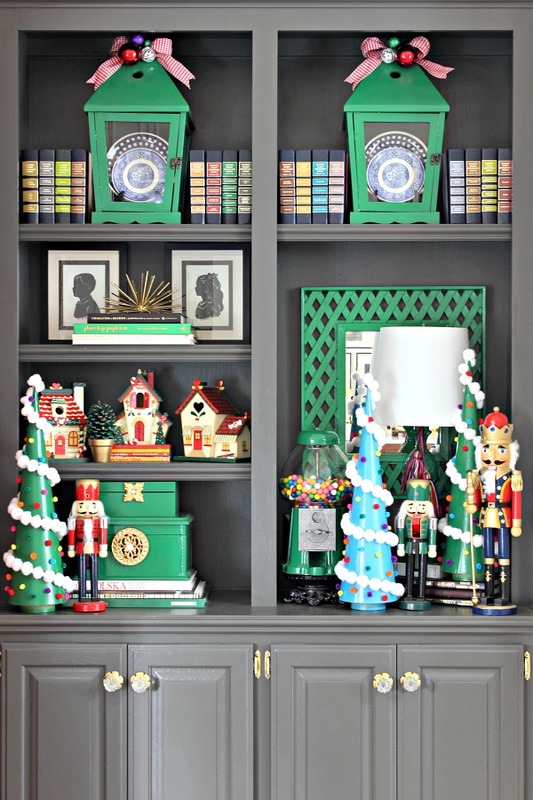 What a find on those vintage ornaments! I would LOVE to find a few boxes. I love how you displayed them in a bowl. Every time I see something from your home, I feel like you have to be one of the funnest people ever. 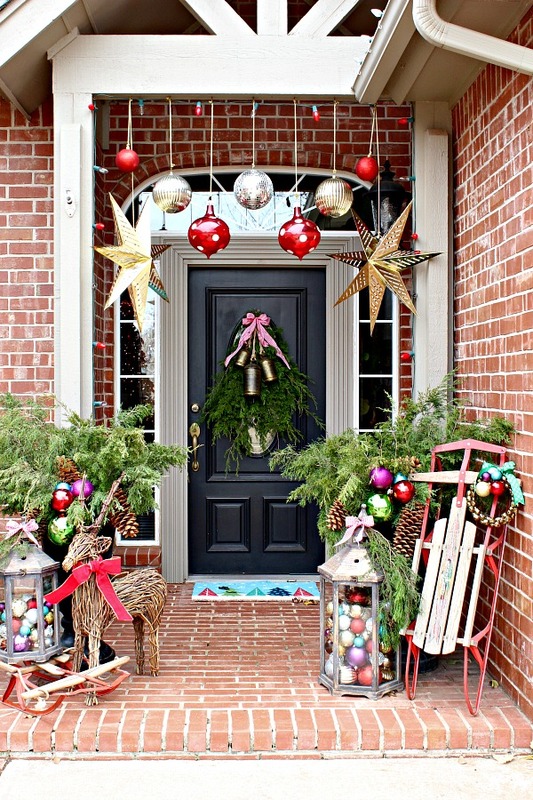 Every single detail is joyful and whimsical and I love it! Your blog is my new favorite! 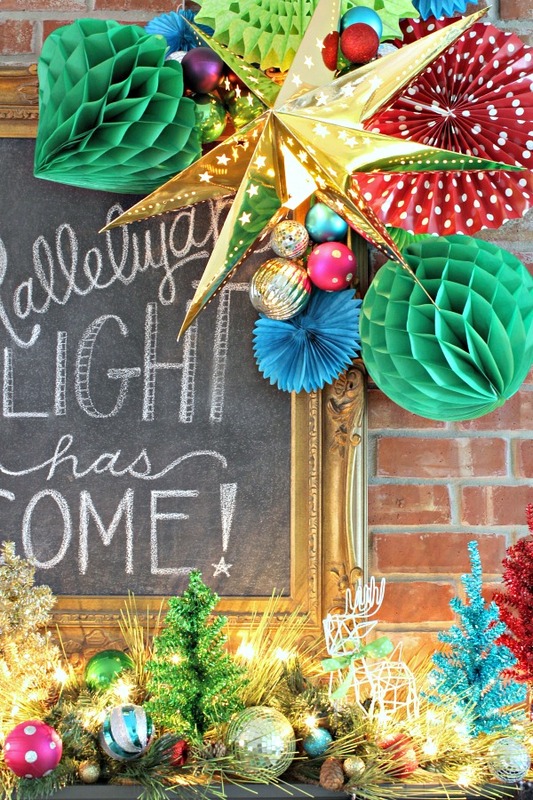 You do color and Christmas like no one else I've seen! Do you have a source for the beautiful gold stars you're using? Hi Joy! I love those stars too. The ones with a light inside were from Ikea a few years ago. The others were from Target last year. I'm not sure if either place has them this year or not. Glad you enjoyed the tour! Beautiful Jennifer! 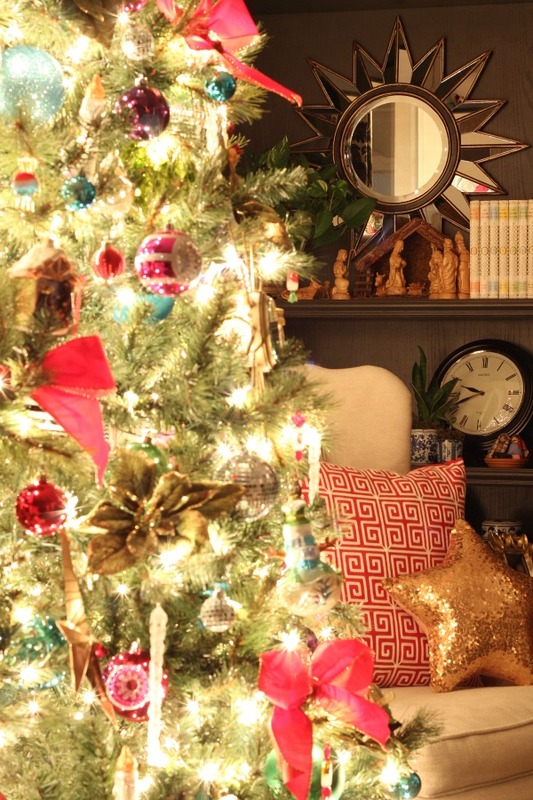 Thanks for sharing all your festive and cheer filled home. Beautiful! I pinned the heck out of this! 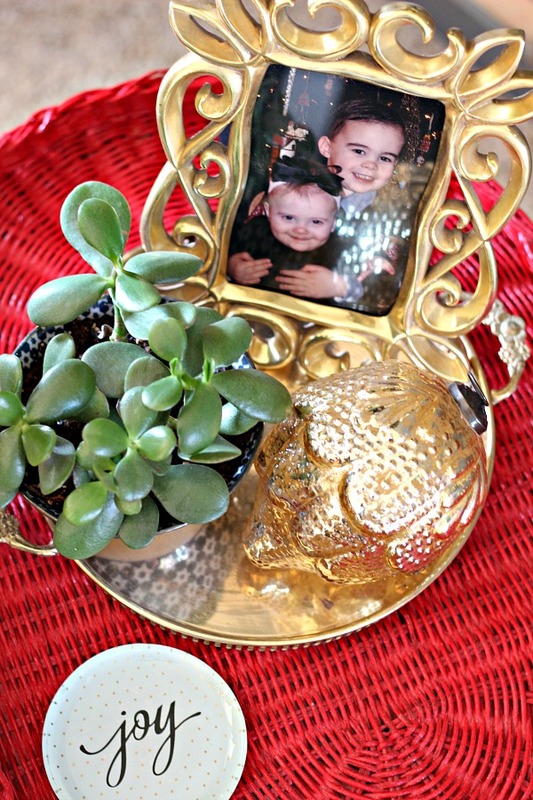 I love how you incorporated ornaments into all of our decorations throughout your home. 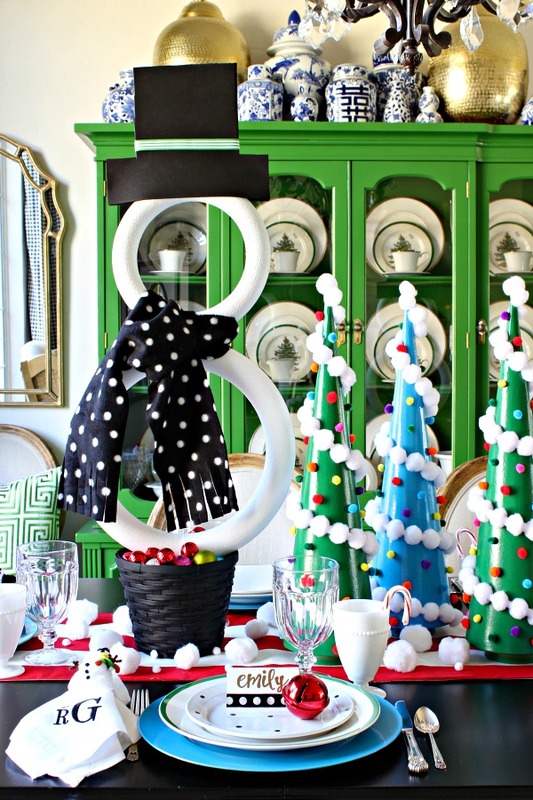 Very fun and festive! Swoon! I always look forward to your home tours, sweet friend! 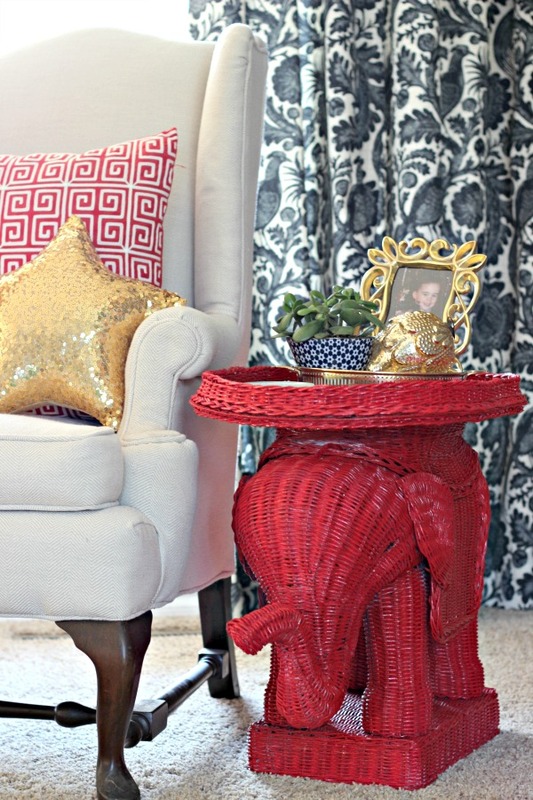 I'm always so inspired by your use of color and this one is no exception! Absolutely gorgeous! Jennifer, you are definitely so creative and talented. ! wow! 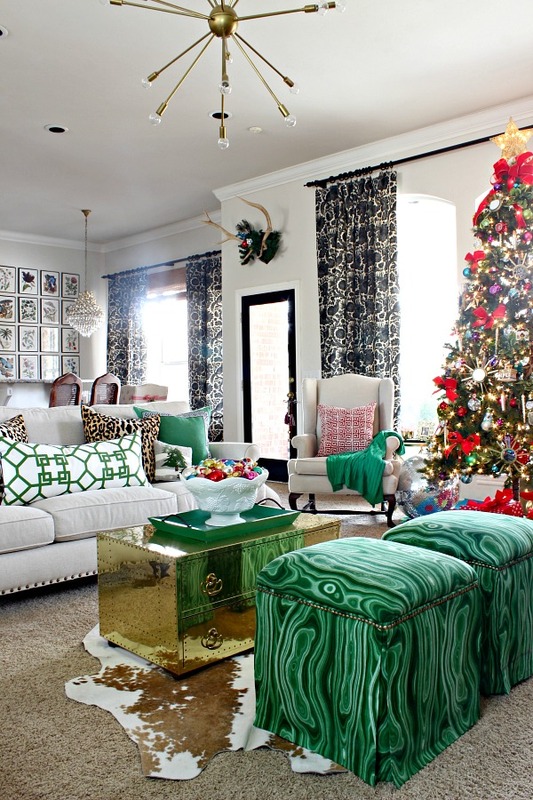 Love, love love all your decorating. 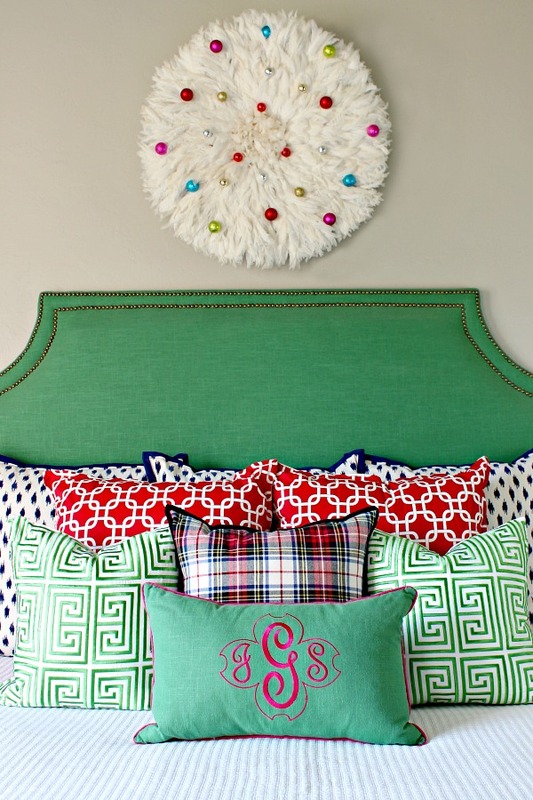 Was wondering about the pom pom wreath looks like ? 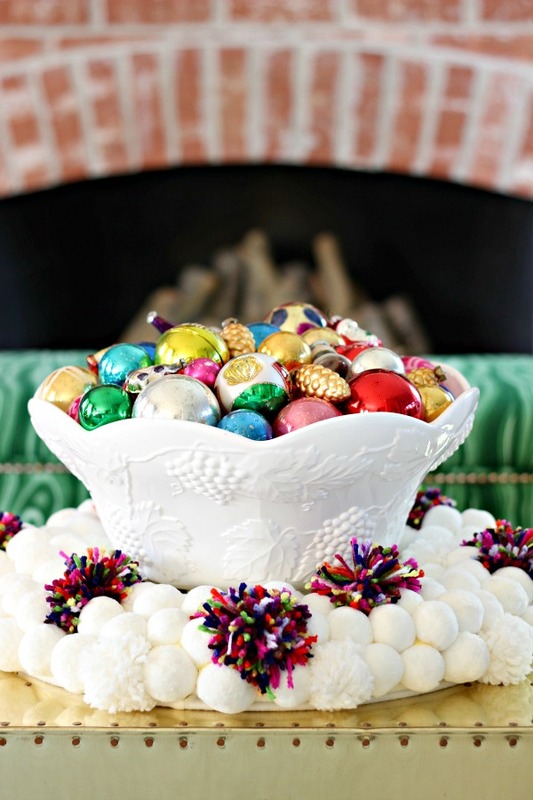 that encircles the punch bowl filled with vintage ornaments, is that something you made ? Also, the star mirror that is in your bookshelves, absolutely love it, where could I find one?. 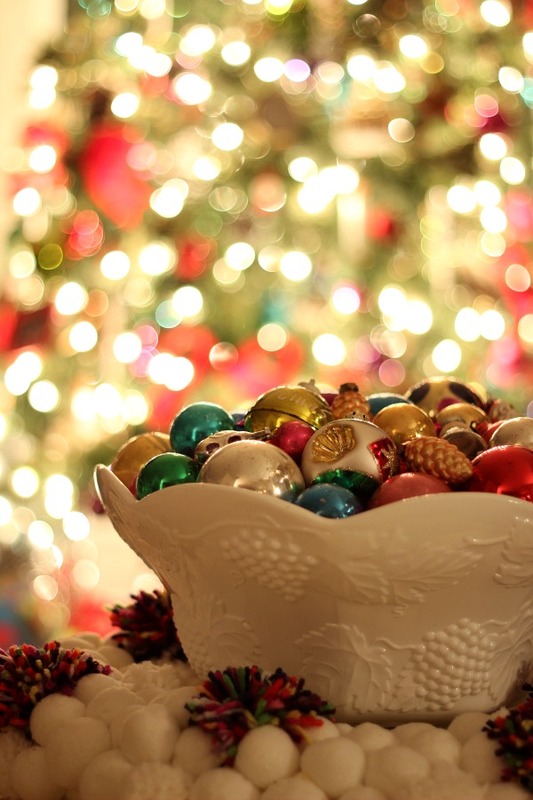 Thanks for sharing your home with us, Merry Christmas to you and your family, God bless. Wow you have a beautifully decorated home. 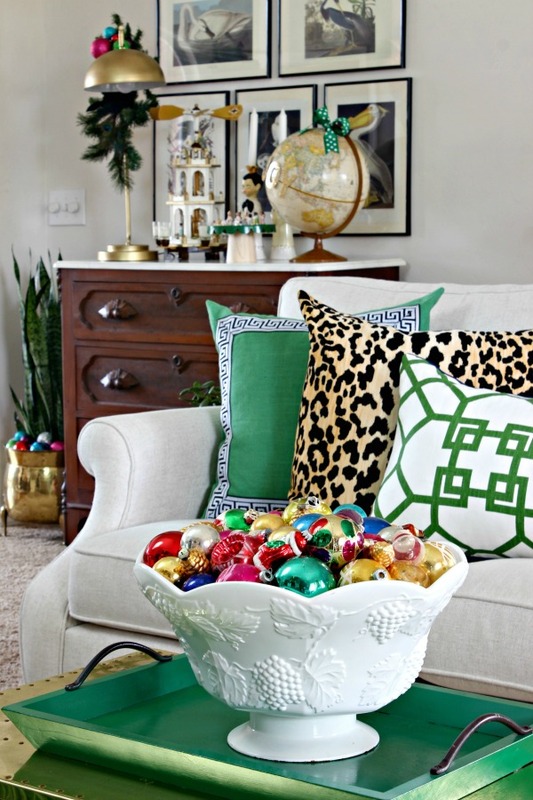 Love all the color and the way you have decorated for Christmas. The tree is wonderful and so is the mantel. 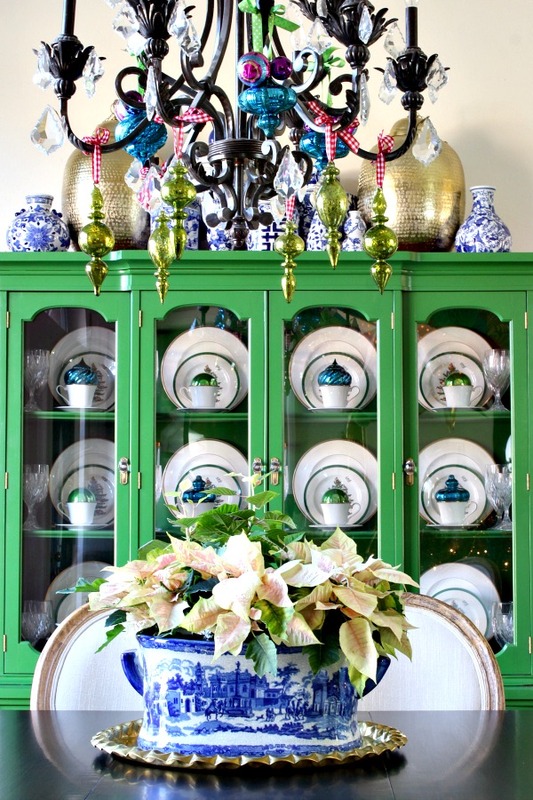 I really like the ornaments in the cups inside the china cabinet. The size and shapes are very eye catching! 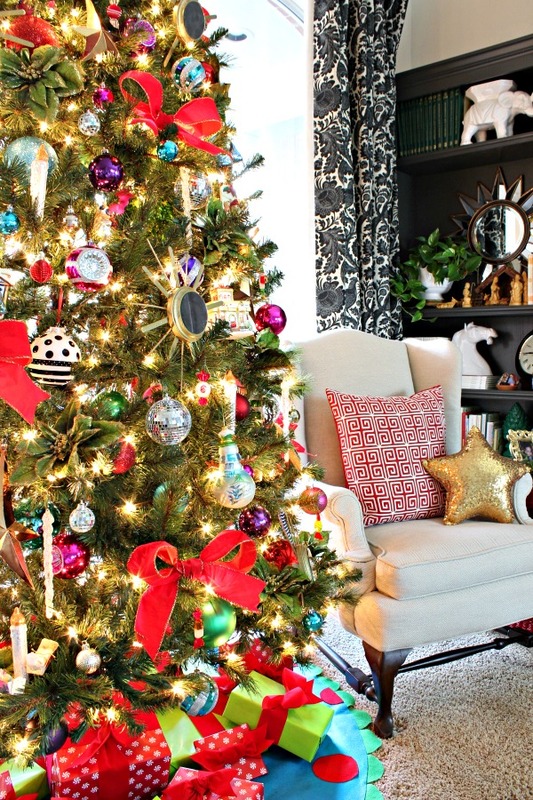 Everything is so cheerful and festive! Visiting from Eleven Gables.